Preheat the oven to 150 deg C and find a heavy casserole dish with a lid (a Le Creuset casserole dish is ideal). 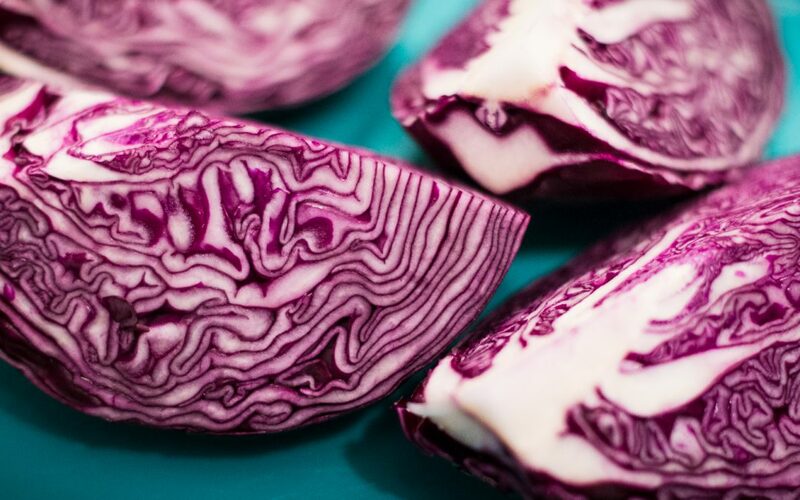 Cut the red cabbage into quarters, cut out the white stem at the bottom, then slice thinly. Peel and core the apples, then cut into small chunks. Put one-third of the red cabbage in a layer in the casserole, followed by one-third of the apples and onions. Sprinkle over one-third of the crushed garlic, one tablespoon of sugar, one tablespoon of balsamic vinegar, then a light sprinkling of nutmeg, ground cloves, ground cinnamon and a quick twist of salt and pepper. Repeat step 4 twice more – you should’ve used up all the ingredients apart from the butter. Put the lid on the casserole and put it in the oven for 2.5 hours, stirring halfway through.